Collaborative Divorce (also known as Collaborative Practice, Collaborative Family Law or Collaborative Law) is an alternative means of resolving a divorce outside of the court system. This form of legal separation is available as an option when considering legal separation in New Hampshire. Developed in 1990, Collaborative Divorce is a specific technique of Alternative Dispute Resolution that has been used with great success around the country, including here in New Hampshire. Different from Divorce Mediation, Collaborative Divorce can also help parties resolve legal disputes through agreement in a structured setting. Collaborative Divorce negotiations draw from a variety of professional advisors and focus on cooperation and settlement with an eye on preserving long-term relationships, especially those of co-parents. Instead of an adversarial court process, Collaborative Divorce uses a client-driven, team approach. In a Collaborative Divorce, the two parties and their collaboratively trained attorneys assemble a team typically including themselves and a Divorce (Mental Health) Coach and a Financial Planning Professional. The team commits to resolve the dispute outside of court. The parties negotiate their own agreement with the help of the professionals on their team. The couple benefits by receiving comprehensive emotional support, co-parenting advice, legal representation, and neutral financial planning throughout the process. Although Collaborative Law originated in family disputes because of its benefit to parties who will have ongoing relationships as co-parents, it is fast being used with success in all types of legal disputes. Through the collaborative process, clients can avoid the many downsides of court battles such as high legal fees, lengthy delays, public airing of personal information, and extensive damage to the relationships between the parties. 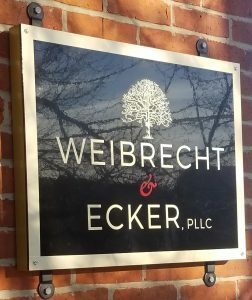 Our attorneys at Weibrecht & Ecker, PLLC are trained and experienced in Collaborative Divorce and are members of the Collaborative Law Association of New Hampshire. Kimberly Weibrecht, Esq. has been a member of the Board of Directors of the Collaborative Law Alliance of New Hampshire for over 5 years and was Co-Chair of the Board for two years.